I know I should really stop moaning about the heat but it really is far too deserving of a good moan! 💦 You’d think it’s too hot for an Indian meal right? So here’s a recipe packed with all those gorgeous flavours but also quick, easy, healthy and refreshing! All you need are some fluffy chappatis and a bowl of raita to accompany it. Or dal and rice! Summer is officially here. Who cares if it's been raining non-stop for the last 24 hours. We've bought (and finished) our first watermelon of the season. So large, I had to stand on tippy toes to get a picture of it! My husband likes working with big things and tools, so out came a giant knife and a huge bag of ice, and some rummaging in the fridge, clanging and whirring later (times like this I pretend I can't see or hear anything - best not to get involved for fear of giving myself a heart attack at the sight of the colossal mess that is my kitchen when Arunn is in it! ), I'm presented with the most delicious glass of watermelon punch. Here's his recipe that he was delighted to share. I'm meant to be following my high protein, low carb diet assiduously. The truth of the matter, though, is that I love my rice and rotis and parathas too much. So I've been racking my brain about what a potential rice substitute could be. Then last week I experimented with cauliflower 'rice', and it's not the real thing of course, but it comes fairly close! What prompted me to think of messing around with cauliflower were two factors: I had one lying in the fridge and it didn't look like either of us had any other plans for it, and because cauliflower pizza bases are all a rage on Pinterest. So I figured, why not rice? Here's my recipe, tell me what you think. If you have a low-carb rice substitute idea, do share! Cover and cook on low for about 30-35 minutes, turning over occasionally, to prevent it from sticking to the base. You may need to add a little water if you feel it's sticking. Try and avoid doing this though, and see if turning the heat down to low helps. A few weeks ago, I shared my chorizo and egg bhurji recipe. I love a good bhurji; you can tweak these Indian spiced scrambled eggs in so many different ways, making for some very yummy and varied brunches. 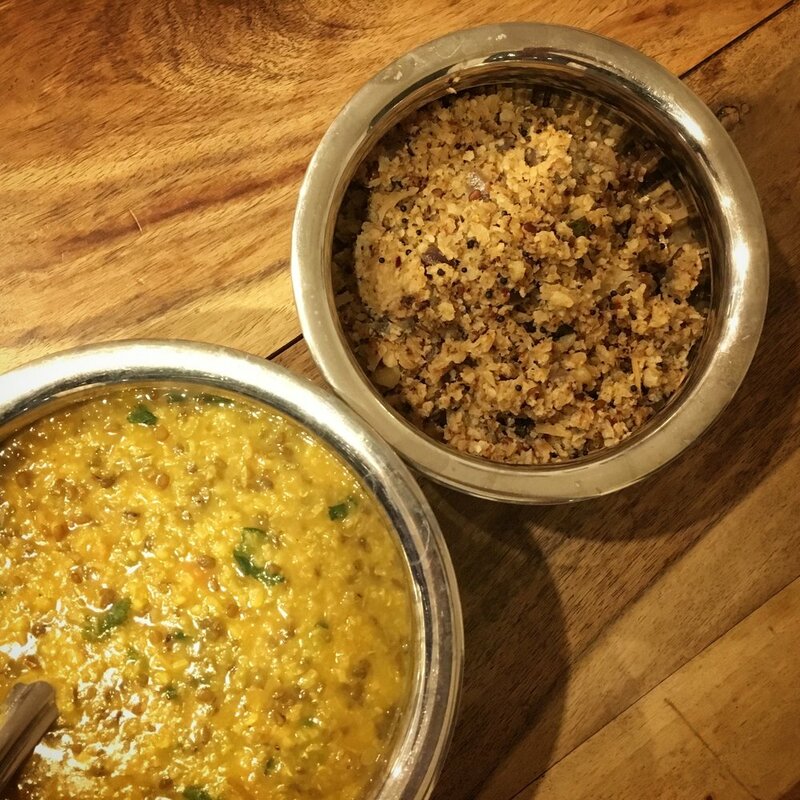 This is my husband's South Indian Egg Bhurji recipe. A chilla is a savoury Indian pancake made with ground lentils and spices, by the way. And here's another dal chilla recipe for you to try out.